Meet universal-design expert, Mary Jo Peterson, who gives great design advice for creating an accessible bathroom that works for everyone in the home. Disabled bathrooms are a necessity in homes where there is at least one occupant who is immobile for disability reasons. designers and bathroom remodeling contractors or builders are more and more convinced of the necessity of constructing or remodeling at least one bathroom in a home that follows the universal design guidelines. These guidelines make all bathrooms easily functional for those who are disabled as well as for those who are not physically challenged. According to the National Alliance for Caregiving, there are over 35 million Americans today who provide home care for someone they love who have some form of limited mobility. The number of disabled, those with chronic illnesses and the elderly is expected to rise significantly as the first wave of baby boomers reach retirement age. As these issues are becoming more apparent, the building and real estate industry is adjusting its outlook on home designs to encourage more floor plans to include universally accessible bathrooms, whether the owner has need of it or not at the time. Who knows when a family will need to bring an aging parent home to live with them whose health may require the use of a handicap bathroom design? In fact, new homes that offer at least one universal design bathroom in their floor plans, automatically are worth more than those which do not. 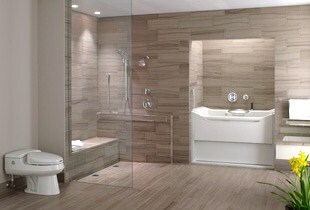 Today's universally accessible residential bathrooms are not designed with an institutional look. Rather, they are very aesthetically pleasing, comfortable, and functional, even though they can be used as bathrooms for the disabled. As she ventured into the arena of universal bathroom design for her clients, she realized that there was a lot of overlap in the concepts with traditional designs that she could forge together to create an even more functional design for everyone in the home. It is no wonder that many design experts are developing plans, combining features and creating functional bathrooms that can be used by just about anyone, no matter their state of health or mobility. It is a smarter, more practical and ultimately, a more economical way to build or remodel a residential bathroom, because it works for everyone in the family. bathroom that is practical for everyone. disabled, and information about universal design for the entire home. "My clients with disabilities were growing in numbers, I continued to work with builders, architects, and referrals from previous clients. I learned that much was possible using the same lovely parts and pieces that had always been a part of the package, but they had to be used in non-traditional ways. I learned that many of the things I designed to support or give access to a client with a disability would also improve the space for an able-bodied client. In fact, I learned that the question to ask clients was what they wanted of a new space, not based on what they already knew a...bath could do, but on what they wished it could do. Aha! My focus need not be people with disabilities to the exclusion of others, but improved flexibility and access for all clients. What a concept! Of course, that concept is universal design, and so I entered, through the back door, into the world of believers in universal design." "At a point in my career and life in general when I was asking if I could hope to make a difference in the world, I turned the focus of my...bath design work to people with disabilities. A past client, now friend and advisor, encouraged me to put my love of people and of creating these two types of spaces together. It was my grand scheme that I would work with each client as I had been, establishing the needs and parameters of the project, and creating a...bathroom that more than accomplished the goals. The difference would be that the client's needs would be non-traditional. The design team would include medical advisors, and the results would be not only beautiful and new, but newly open to the client."